Love, Forgive, Never Give Up Is Finally Here!!! I’m SO EXCITED!!! The day has finally come! After more than a year of writing, editing, writing, editing—literal blood, sweat and tears—Love, Forgive, Never Give Up is available on Amazon TODAY! And as a special bonus, we are offering it for just 99 cents on Kindle for the first few days, so grab your copy now before the introductory promotion price expires! 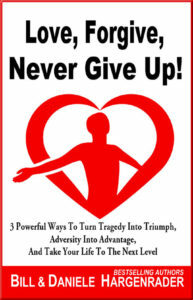 If you know anyone who has experienced adversity or tragedy in their lives and could use a little easy to follow wisdom on how to turn it into advantage and triumph for themselves and those they love, please share this awesome deal with everyone you know by sharing this blog, and/or grab a few copies to keep on hand to give as meaningful gifts to those you love anytime! We also have a bonus for anyone that leaves a review: A free copy of Love, Forgive, Never Give Up: Book 2 as soon as it becomes available. Just let me know when you leave your review by sending an email to [email protected] and we’ll add you to the bonus list right away! As always, let’s choose to be more loving today, both toward ourselves and others, because you deserve it, and the world needs as much love as it can get!